NEW YORK, March 8 (UPI) — Insufficient evidence that North Korea has fully developed long-range missile systems could mean Pyongyang is mainly using its weapons program as a political deterrent, a U.S. analyst said. Michael Elleman, a senior fellow for Missile Defense at the International Institute for Strategic Studies in Washington, D.C., told UPI Wednesday that if the main objective for Kim Jong Un is deterrent capacity, then further testing is probably not necessary. The assessment from Elleman comes as North Korea pursues an unprecedented level of engagement with Seoul and has even signaled some interest in talking denuclearization with the United States. Kim “intimated that the North Koreans were done developing the weapons,” Elleman said, referring to the North Korean leader’s New Year speech. “They’ve said they’ve got their arsenal, they’re just going to do production now. “But that surprised me a little bit, because he had not fully developed these long-range systems,” the analyst said. Elleman, a missile technology expert, said North Korea’s intercontinental ballistic missiles were tested in a way that casts some doubt on claims Pyongyang’s weapons pose an existential threat to the U.S. homeland and on North Korean claims it has completed acquiring nuclear-tipped missile capability. “They shot [the Hwasong-15] straight up like a space probe [in November], as opposed to a ballistic missile,” the analyst said, adding only a small number of tests were conducted for other missiles like the Hwasong-14 and 12. Elleman said Kim has a political deterrent that is “not viable” in the way U.S. and Russian nuclear arsenals are designed, but has still come at a heavy price for the North Korean regime. Despite possible transfers of material hardware from the former Soviet Union as far back as the ’90s, other technology like missile airframes are likely being produced domestically. 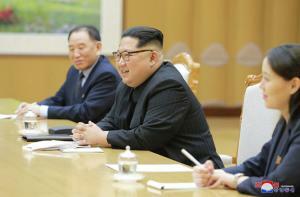 The analyst, who previously served on a United Nations monitoring team for weapons inspection in Iraq, said North Korea’s investments have been significant and costs heavy owing to sanctions. But it is still unclear, he says, what Kim wants out of a program that has taken a toll on the North Korean people. Meanwhile, as bold moves from Pyongyang, including a planned April summit between Kim and South Korean President Moon Jae-in, are inviting diverging interpretations, Charles Armstrong, the Korea Foundation professor of Korean studies at Columbia University, says North Korea is unambiguously sending a message to the United States. Armstrong, who has studied the relatively isolated regime for decades, said the inter-Korea reconciliation that began with hasty preparations in January — ahead of the 2018 Pyeongchang Winter Olympics — is a blend of old and new tactics on both sides of the Korean demilitarized zone. The meetings are “leading to the first North-South summit in over 10 years, so it’s getting back on to a track of engagement that had been abandoned since 2008,” Armstrong said, adding the situation deteriorated quickly during the terms of conservative South Korean leaders Lee Myung-bak and Park Geun-hye. The analyst also said North Korea could prove to be more cooperative than expected, and Moon’s persistence has paid off. “It is clear North Korea isn’t going to give up its nuclear weapons any time soon, but they’ve also never taken denuclearization off the table,” he said, adding North Korea has previously de-escalated nuclear standoffs in 1994 and again in 2006. “But for any major breakthrough to take place, there needs to be a direct and face-to-face meeting between Kim Jong Un and Donald Trump,” Armstrong said. “President Trump has sent mixed signals on this for a long time…but he has been cautiously supporting these new inter-Korea initiatives in his latest tweets, so we will see where this goes. Elleman said he is in favor of engagement because of the stability the process could restore for the United States and its allies in the region. “I still think if we can get a test moratorium and a production moratorium on nuclear materials, that’s verifiable, I think it does a lot for the security of the world,” he said, adding he remains skeptical whether negotiations will meet U.S. objectives. “I am particularly interested to see how the Trump administration will react. It will be interesting to see how they react or adjust their strategy,” Elleman said.